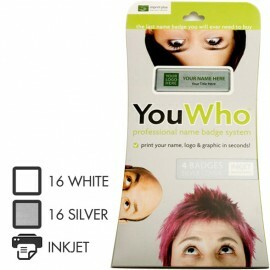 YouWho™ Badge Starter Kit There are 2 products. YouWho™ Self-Print Badges are manufactured by Imprint Plus™ to satisfy demand for the Mighty Badge™ re-usable name badge system to be produced in smaller kits more accessible to the sole trader, individual or small business wishing to make an impact with quick and easily printed high quality, professional, corporate looking name badges. Each YouWho™ Name Badge kit consists of 4 name plates, magnetic fasteners and protective front lens covers as well as 16 transparent and 16 bright white printable YouWho™ badge inserts, with the option to reprint up to 32 brand new name badges. Simply select the kit that is compatible with your LASER or INKJET printer from the selection below.